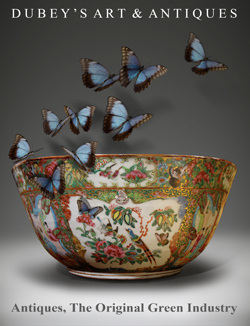 Philip Dubey started collecting Chinese Export Porcelain when he was in high school and his passion continues to this day. In 1989 Dubey’s Art & Antiques, Inc. was opened on historic Antique Row in Baltimore. The shop began with 900 square feet of showroom space and has grown to more than 3,000 square feet over the years. Phil Dubey is an advocate for Antique Row and the Mt. Vernon Cultural Arts District and lectures at civic organizations, colleges & universities, and notable Baltimore sites such as Mt. Clare Museum House and Mt. Vernon Club. In October 2004 he opened Antique Row Stalls, LLC, a multi-dealer gallery occupying a 10,000 square foot building next door to his store. Dubey’s Art & Antiques and Antique Row Stalls have been featured in articles in Baltimore Magazine, the Baltimore Sun, the Washington Post and the New York Times among others. "We have the largest selection of Chinese Export Porcelain in the Baltimore/Washington metro area."